Posted 5/19/2014 5:50am by Dave & Jen Paulk. Hello Farm Fans, This past Saturday we completed our 6th farmer's market for 2014. It feels like the cold winter is behind and that everyone is getting back into the groove of growing and eating local produce. Thank you for supporting our little farm! We thrive on your enthusiasm and energy! The extended cool weather has been a rare treat and perfect for spring crops such as strawberries. The berries were ready to harvest this week, one of several fruits we grow, and they have excellent flavor. We need to enjoy them while they are here, since the season in Southern Maryland for them is very short because of the hot summers. More temperate areas can continue to grow them through much of the summer/fall. We should have them at the next market and we've been selling them to our friends at The Good Earth Natural Foods Co., Keeping It Local, and Chesapeake's Bounty throughout the week. Looking around the farm, our cover crop of rye and clover is at its peak. Soon we'll mow the crop down and plant our summer cover crops. We grow cover crops to improve our soils, attract beneficial insects and birds and help keep weeds shaded out - always a challenge on an organic farm. Most of our summer crops are in the fields growing and looking great. Our first planting of Tomatoes, Cukes and Squash are in the ground, followed soon by Peppers and Watermelon. In addition, all the early spring crops including, Kale, Lettuces, Peas, Beets, Chard, Scallions, Spinach, Onions and looking really nice. And we also noticed that very soon we'll have Garlic Scapes and Sweet Onions. We should also have some nice early season New Potatoes in a few more weeks. Had a pleasant surprise yesterday, we have figs trees! Last fall we planted 12 figs trees and we thought all of them got zapped by the single-digit temperatures as they looked like little brown dead sticks in March. Low and behold, while walking the farm, we saw new green growth on 9 of them yesterday! It will take a few seasons to produce figs but in the future we'll have them at the market for all you fig lovers. Finally, we've been managing our three bee hives and quickly learning more about these fascinating insects. With a little luck, we might be able to let them share a little honey. One more thing, we are looking to hire another part-time worker to help harvest on Friday’s. Please visit our Employment tab for details. What's Going to the BAE Farmer's Market Saturday, 9 am - 1 pm UPDATE! Posted 5/15/2014 8:39pm by David Paulk. Update! We can't believe we forgot to mention that we also have big, beautiful Swiss Chard and spinach! We know how much you like both. It was so great to be back at the BAE market this last Saturday and see so many familiar faces. Thank you for making us feel welcome. Yes, spring is here, finally, and that means we have a lot of delicious seasonal vegetables freshly harvested from our farm. - Strawberries (New!) - Wonderfully sweet organic, heirloom strawberries. Nothing but natural goodness. - Bibb Lettuce (New!) - mild, tender bibb lettuce, an excellent choice for a delicious salad with strawberries. - Red Leaf Lettuce – Big, tender heads perfect for any salad. Try with a little balsamic dressing and fresh cracked pepper. - Romaine Lettuce – Big, fresh heads that add that crunch we like in salads. - Mesculin Mix – Ready to eat salad. Delicious blend of reds and greens. - Arugula – Add a little spice to your life! - Sauté Mix - A delicious mix of super healthy greens; great raw or sauteed. - French Sorrel – The herb with a lemony zest for your fish and salad dishes. - Radishes – French Breakfast, Pink Beauty. Add some spice to you crunch. - Hakurei Turnips - White, sweet and crunchy. Wonderful raw in salads or simply sauteed or steamed, along with the greens. Posted 5/15/2014 8:31pm by David Paulk. Posted 5/9/2014 5:58am by David Paulk. UPDATE: Will be selling at the BAE FARMER'S MARKET this Saturday. Yes, the time has come to move uptown to our summer location! Spring is finally here, the crops in the fields are rocking and we've been very busy planting, cultivation and tending to a variety of vegetables. We'll have a steady supply of delicious veggies from here until November but please don't wait until November to visit us! - Scallions – We like them on homemade pizza! - French Sorrel – Add some lemony zest your plate. Posted 3/17/2014 4:33pm by David Paulk. All the talk among market farmers this year has been wondering just how long winter will last. Most of us who "push" the season, that is, grow outside the typical planting time, are three weeks behind schedule. "Normally", we would have a lot of plantings completed but not so this year. In an effort to get caught-up, we took advantage of this weekend's brief period of beautiful weather to get a lot of work done and done quickly. In the mad rush, we were able to get into some of our fields to add compost, till soil and transplanted mesculin, braising mix, scallions and directly seed radishes, beets, peas, kale and raab. We also managed to squeeze in a harvest for our friends at Woodberry Kitchen, The Good Earth Natural Foods Store and Blue Heron B & B. Overall, we made a lot of head way in three short days especially seeding crops even though it's a bit risky to be planting in cold weather. But that's what makes vegetable farming challenging and rewarding. Hopefully warmer temperatures are coming soon. Posted 3/9/2014 3:08pm by David and Jennifer Paulk. Well, the coldest winter in several decades and soggy ground. Thankfully, the large flock of Canada geese that have been camped out in our fields moved onward yesterday - a sure sign spring is (almost) here. Like everyone else we have really been looking forward to the warm and sunny weather so we could get caught up on planting in the fields. As it is, we have delayed planting many of the direct seeded crops like kale, peas and beets because the soil temperatures have been so cold that we would potentially have really poor germination especially in wet soil. So we're happy to see the sun this weekend to help dry things out. We did manage to transplant leeks in between snow storms last Sunday on previously prepared fall beds and have a back log of onions ready for transplants hopefully this week provided we can get into the fields with the tractor. Otherwise we have been busy interviewing new employees, working in the high-tunnel, and updating our annual organic certification application. We've also been selling some nice produce to our friends at the Good Earth Natural Foods Store in Leonadtown. Last, our first market day will be Saturday, April 5th at the HomeGrown Farm Market (just south of Gate 3). We look forward to seeing you all there in a few short weeks. Posted 2/6/2014 4:09pm by Sassafras Creek Farm. Posted 1/29/2014 7:08am by David Paulk. Farmers Dave and Jen are proud members of START (Starting, Transitioning And ReTurning) Farmers' Network, a new program here in southern Maryland for new, young and beginning farmers. The program provides assistance and resources from technical training, mentor matching and access to farmland. 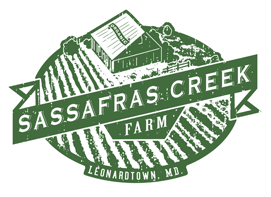 Formed in 2013, the group meets approximately monthly to network, discuss challenges, hear from experts and guest speakers, tour successful farms and more. Posted 1/23/2014 2:42pm by David Paulk. Posted 1/19/2014 5:59pm by David Paulk. This weekend we attended the 15th Annual Future Harvest CASA farm conference at the University of Maryland College Park. Farm conferences are really important events. It's when we get to see farmer friends, meet new ones, attend workshops ranging from how to grow veggies; to secure micro-loans; animal nutrition to policy support. But most importantly, it’s a chance to validate why we all collectively work so hard. This conference was particularly noteworthy, as we celebrated the newly agreed merger between CASA and PASA. Both organizations are dedicated to promoting sustainable agriculture and environmental stewardship. The merger will bring together all of the major Chesapeake Bay states under one association with one voice. We think this is a great move to help bring locally produced food to our region. The other news is we've got the greenhouse fired-up with onions, scallions, shallots, tomatoes and peppers. In a few short weeks, we'll be transplanting these crops in our new high-tunnel with the idea that they'll be ready for the farmers' market in May. Your farmers, Dave and Jen.